The PC2A T-Type Leveling Amplifier emulates a classic hardware optical compressor. An optical compressor is different from a FET style compressor in that it uses a luminescent panel and photocell to determine the amount of compression, attack and release times. These controls are not fixed but rather are dependent on the reaction of the photocell which is determined by the audio source. During operation, audio input may reach high enough levels when the internal light panel begins to illuminate, thereby triggering the nearby photocell. This is the point where gain-reduction (i.e. compression) begins since an illuminated photocell acts like an automatic volume knob (attenuating the input more and more as it gets louder and louder). Longer, multi-stage release times result from high activity levels of gain-reduction. Attack times become snappier as the input becomes more active, and more relaxed (slower) during periods of less frequent activity. Ultimately, the photocell has unique properties that make optical compressors the choice compressor for vocals and other material with smoother transients. Given the nature of how this works, however, after long periods of silence the compressor can become very sluggish in its ability to reduce the gain of sudden transients. Under these conditions, the onset of a new transient can result in a “pop” at the output as the compressor is “waking up”. Since this behavior might not be desirable, we’ve included the option “Fast Reset” to allow a faster wake-up time and to avoid the potential pop. Also included is a “Classic” mode that sticks to the true emulation and responds like the original hardware. By default the PC2A T-Type Leveling Amplifier will insert with the Photocell Memory option set to "Fast Attack". 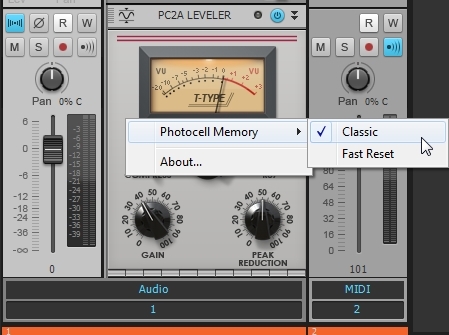 If you desire the Classic mode, switching is as simple as right-clicking over the empty, gray area of the PC2A's interface (not over a control) and selecting Photocell Memory > Classic as shown in the image above. Did you know SONAR X3 comes with a Dual Phaser and Chorus?